Happy Thursday Team Stryker fans! Sorry for the late post but Calgary is going through a major storm right now and it has made getting an internet connection a little more difficult than usual. 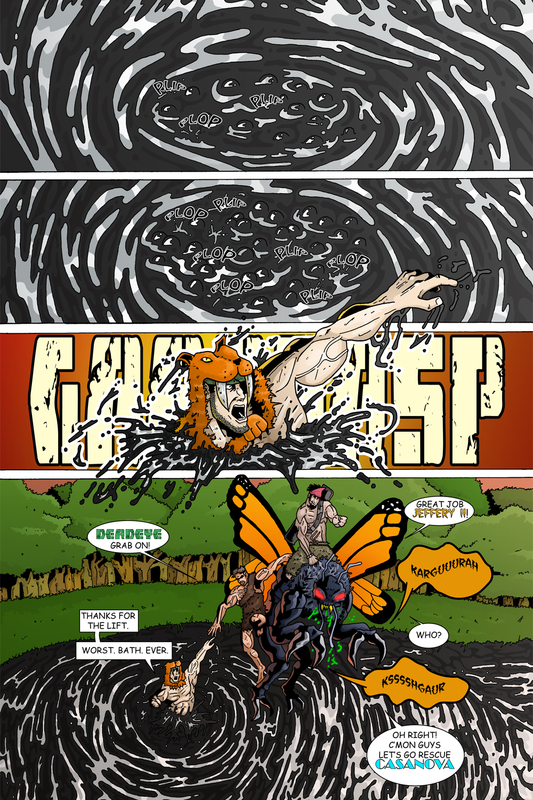 Today’s page continues the tradition of Deadeye emerging out of the weirdest places to the surprise of usually no one. I never want to try and shoe horn jokes in just because I can but if I can find a reasonable excuse for Deadeye to emerge out of something I will do it! Since adding page 19 on Monday I’ve had a lot of requests for Jeffery II shirts and posters so I will try my best to make those readily available to you as soon as humanly possible! Have a great weekend and I will see you all back here on Monday! Keep checking the Team Stryker Twitter and Facebook to know exactly when you can get your hands on some Jeffery II merch.